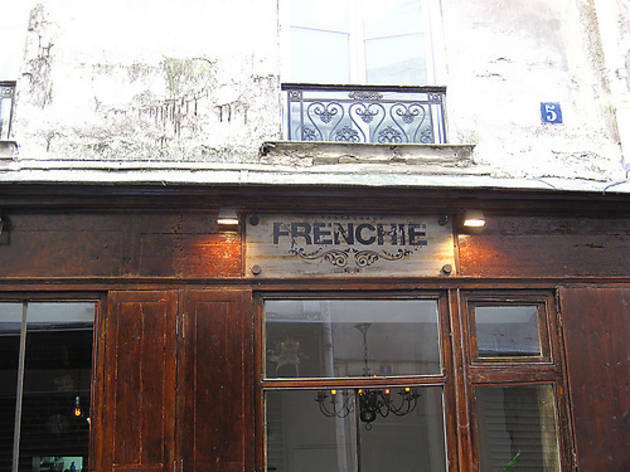 Grégory Marchand’s restaurant Frenchie has become legendary not just for the quality of its food, but for the almost superhuman effort required to secure a table in the tiny dining room. Luckily there is Frenchie Bar à Vins across the street, where you can sample his Anglo-influenced take on bistro cooking without a reservation. Showing up just after 7pm, we were able to take our pick of the high tables, some of which already had a few occupants. This is the sort of place where neighbours quickly become friends, and before long we were exchanging cards and even bites of food with the Japanese-French group on our left and the journalist from New York on our right. Divided into categories such as meat, fish and antipasti, with two or three small plates on offer for each, the menu encourages nibbling and sharing. Burrata, a bit of a cliché on Paris bistro menus this year, came with slices of boudin noir (black pudding) and one of the chutneys for which Marchand has become famous, made here with apple. There wasn’t a lot of boudin in relation to the wobbly cloud of cheese, but the balance seemed right and the chutney added a welcome sweet-sour note. The adventurous-sounding tête de cochon (pig’s head) turned out to be mostly pork cheek, served with a dab of creamy parsnip purée, white coco beans and girolle mushrooms. Continuing with the piggy theme, we ordered the pulled pork sandwich, a classic from the American south. Served on a brioche bun, the shredded meat seasoned with vinegar and smoky barbecue sauce turned out to be so addictive that we asked for another one, and would happily have returned the next day to eat two more. To finish, a very intense chocolate pot de crème came topped with a drizzling of potent olive oil that to us seemed out of place in a dessert. A seasonal dessert, pannacotta with sage and lemon, wouldn’t have won a beauty contest but the flavour made up for it. The perfectly bilingual waiter suggested a white wine from Savoie (the Berlioz Chignin) to accompany our meal, which pleasantly surprised the wine expert in our group. Frenchie isn’t exactly cheap when you add it all up at the end, but it’s hard to think of a better spot for an impromptu meal with old and new friends. 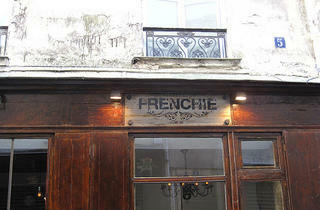 Being an experienced restaurant guest we had a very unusual and disappointing experience at Frenchie Restaurant. The room was very hot and needed some fresh air. The amuse bouche was a poor gazpacho of strawberry and tabasco; the latter being a relatively strange ingredient for "fine dining" restaurant. We asked for the fish / meat dishes to be "well done" - initially upon ordering and also to the waiter ahead of the dishes being served. Everytime they reassured us that this was duly noted. Nevertheless, the fish was served borderline uncooked. And later the duck arrived outright red and nowhere near well done. Instead of apologising for the obvious mistake, the waiter proudly insisted that it was well done but offered it to be cooked more. This was quite unprofessional after having communicated it twice already (To avoid any risk of toxoplasmosis infection the dish would have needed to be completely redone). The manager was not responsive and felt we had insulted his waiter, so we decided to leave early (and were asked to pay the lion's share of the bill). Would recommend people to try e.g. Aspic or Mumi, which have similar pricing but way better cooking and with a much more comfortable service. At Frenchie the customer is apparently never right.